Show off and protect your prized treasures! 20.5"w. x 10.5"d. x 13.5"h.
Organize, secure and showcase all the pieces you’ve worked so hard to collect throughout the years. 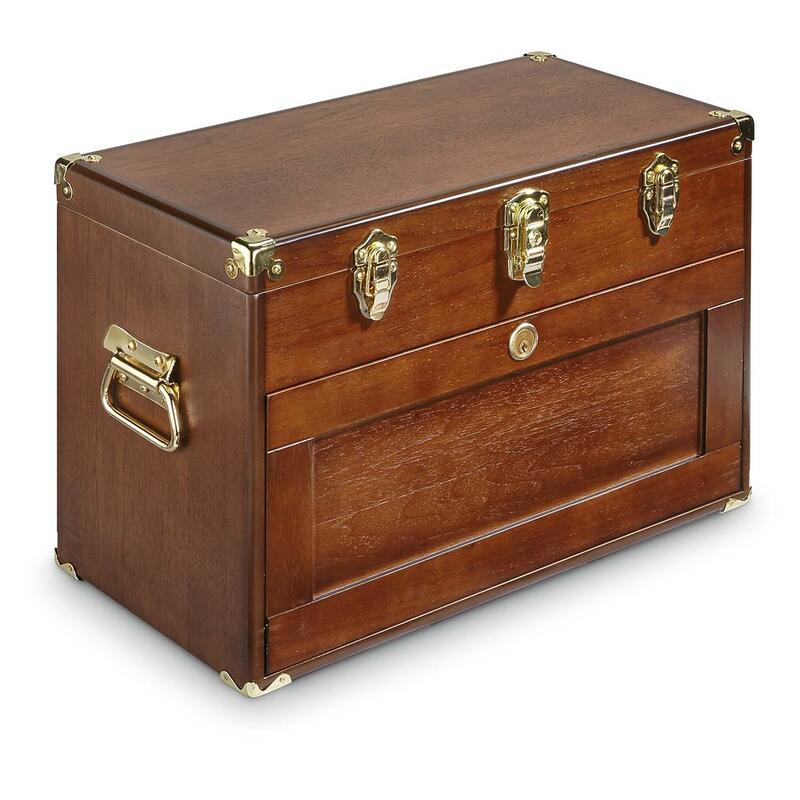 This Castlecreek 4-Drawer Chest makes it easy with cozy felt-lined drawers and rich hardwood accents. 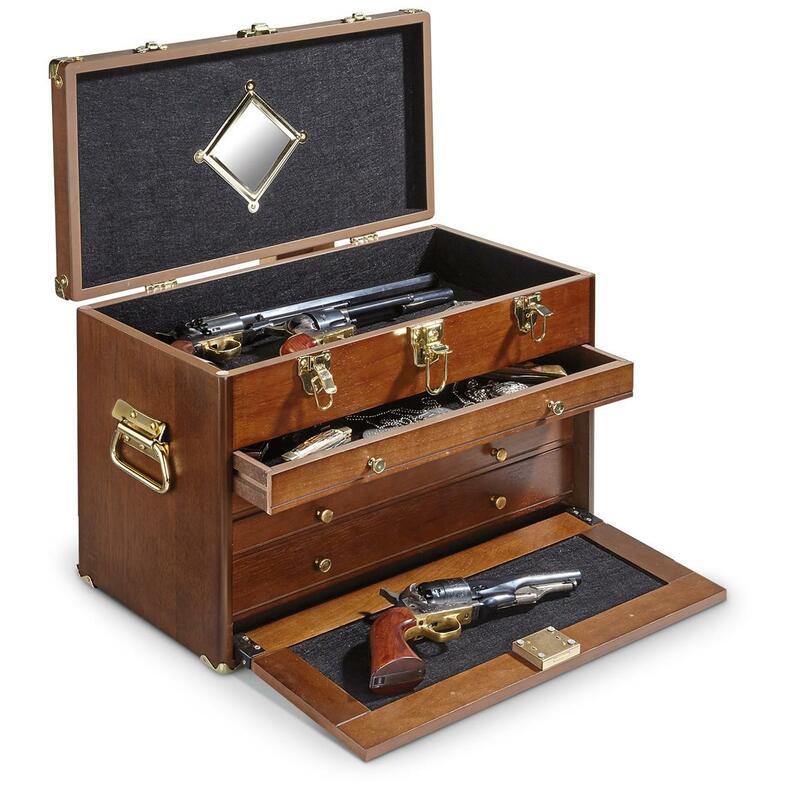 Outdoorsmen style to a T, ready to hold keepsakes like coins, pocket knives, patches and pins, fishing lures and more. Get your Collector's Chest today! Overall Dimensions: 20.5"w. x 10.5"d. x 13.5"h.
CASTLECREEK 4-Drawer Collectors Chest is rated 4.0 out of 5 by 39. Rated 2 out of 5 by joe1 from arrived broken I received this and the bottom drawer slide was broken. I was able to repair this and make it function ok. Rated 2 out of 5 by Erik from Looks great from a distance... The finish was sub-par at best. The fit of the front door is very loose when in the locked position. The felt lining was installed and finished poorly.But for $80.00 delivered I can do a little sanding and trim the felt. 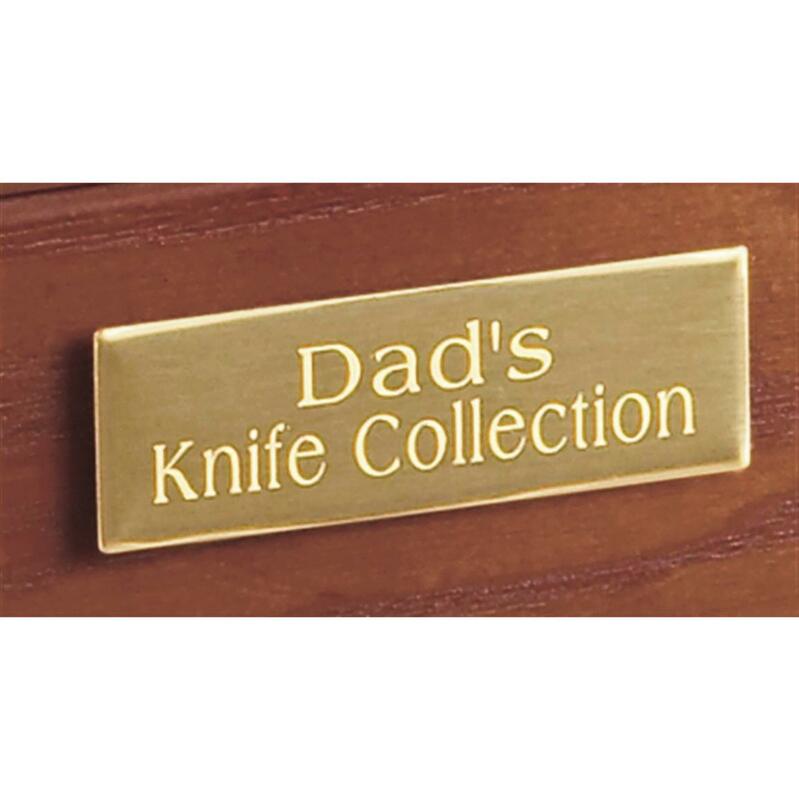 Rated 3 out of 5 by apierce26 from Great piece Beautiful piece for my husband to store his collectables and he absolutely loved it. I'm only giving it 3 stars though because it came with a lot of chips in the wood. The key is also difficult to use the whole is very tight and it makes it hard to turn the key. Rated 5 out of 5 by Wood from Product is worth the price I bought this product to check the product quality before I buy the whole set. It is worth the price in my opinion. I will buy the rest of the set someday. Rated 2 out of 5 by joe k from poor workmanship! the key lock is 1 inch off center. poor quality control. Rated 5 out of 5 by Greg O from Surprise quality Great quality. Looks better in person. Holds a lot. Would be better if the fold down door would lock when top lid is dow and latched. As is you need to use key to ensure it stays closed. Not a big deal. I really like it. It came within 2 days of order. Very impressive speed. Packed well.